The 65-year-old son of Malaysia's second prime minister is also trying to build an image as a folksy voice of working people, especially members of the ethnic Malay majority. 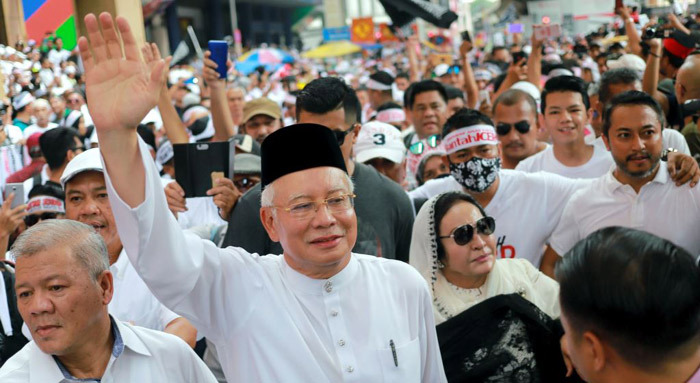 Najib, in a viral video last month, crooned a Malay-language version of the 1970s hit "Kiss and Say Goodbye," surrounded by a chorus of somber young singers, criticizing Mahathir's coalition for failing to live up to election promises. Najib has also been hitting out online. His jibes against ruling party politicians on Facebook and Twitter have some social media users referring to him as "King of Trolls." A relaxed, casually dressed Najib also paid a visit this month to Langkawi, Mahathir's island constituency, where he went around town, visiting markets, eating at hawker stalls and rubbing elbows and posing for selfies with passers-by. Mahathir was not impressed. He told a news conference last week Najib seemed to be getting popular on social media because "he provides a lot of stories." Harvinderjit Singh, one of Najib's lawyers, declined to comment on the former premier's public appearances but said the 1MDB trials were unlikely to be affected by the hoopla. "The case is going to be determined by what happens in court, not out of it," he said. The prosecution has been recruiting top notch criminal attorneys including former federal court judge Gopal Sri Ram and Sulaiman Abdullah, a lawyer with a background in cases of white-collar crime. The AGC has also recalled several prosecutors from state offices to join the team, two lawyers with knowledge of the matter said. Najib could face years in prison. He faces 39 criminal charges over losses at 1MDB and other state entities. Seven of those charges will be the subject of Tuesday's trial, relating to transfers totaling 42 million ringgit ($10.30 million) into Najib's personal bank account from SRC International, a former 1MDB unit. Prosecutors have handed nearly 3,000 pages of documents to the defense ahead of the trial, said Najib's lawyer Singh. The documents include statements from 26 witnesses, some of whom were SRC officials, who will likely be called to testify. Najib, who has not been asked to testify in his own defense, hopes only for a fair trial, Singh said. "Our client is of the view that if he gets a fair trial, then the truth will show itself to the public," he said.